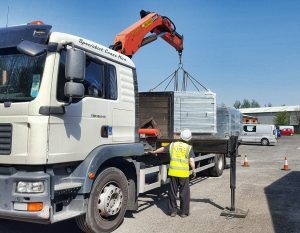 M&J Distribution, based near Chesterfield and just off the M1 junction 29, provides a wide range of light-haulage and transport services to a broad range of customers. We are renowned for our quality of service & reliability, and our cargo is often high-value and time-sensitive. Our customer range from Building, Sewage Treatment & Engineering Companies to Shop Fitting & Window Manufacturers. Our business dates back to the 1990s when the Mercury Express franchise was formed to answer the need for a coordinated platform for Couriers to successfully operate as individuals whilst having the umbrella of a network providing a joined-up service. M & J Distribution wants to retain the excellent charateristics that we learned from running a courier & small van service – such as responsiveness, attention- to-detail, and a dedicated service – but translate that into a light haulage company. This allows us to continue provide a high-quality, bespoke, and customer-orientated service but for a more diverse customer base. For the last 5 years, with the help of our dedicated and hard working team, we have steadily moved from a 3.5t-only operation to build a range of services from 3.5t flat-bed or curtained vehicles right up to 18t flats with ‘hiab’ facility. Today, M & J Distribution Limited continue to grow from strength to strength, building a strong, loyal, and local customer base. We maintain our core values, growing dynamically, to offer to existing and new customers an even better bespoke service. Our business plan for the next 5 years sees us developing and strengthening our offering including improving our fleet and continuing the recruitment and ongoing personal development of drivers to meet this increasing demand.